Have you seen these at your gym or do you wonder what people are using them for? They are amazing little discs that make you work muscles you didn’t realize you had. If you have haven’t seen these or can’t get access to a pair, you can make you own. Use two small towels under your feet if your on a gym or wood floor and use a smooth paper plate under each foot if your on carpet. 1. Bear Crawl: Place gliders under your feet and move across the room on your hands and knees. 2. Burpees: Place gliders under your feet for when you slide them and jump. 3. Side Lunge/Cardio: Place gliders under your feet and lunge side to side. 4. Mountain Climb: Place gliders under your feet and pull your knees up to your chest one at a time. 5. 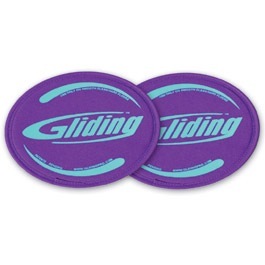 Push Up Slides: Place gliders under your hands and slide them apart and back together. 6. Crab Walk: Place gliders under your feet and walk around on your hands and knees facing the ceiling. 7. Swim: Lay on your stomach wit gliders under your hands. 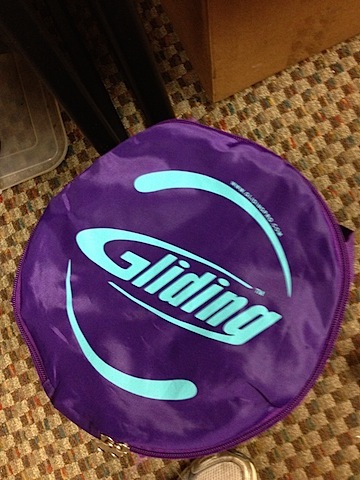 Slide gliders apart by moving your arms wide and back together. Concentrate on using your upper back. 9. Spiderman: Place gliders under hands and feet and in a plank position, slide opposite foot and hand away from your body. Use your core to stay low. 10. Lunge: Place gliders under your toes and alternate lifting your heel to slide your leg into a lunge position. Repeat on other side.